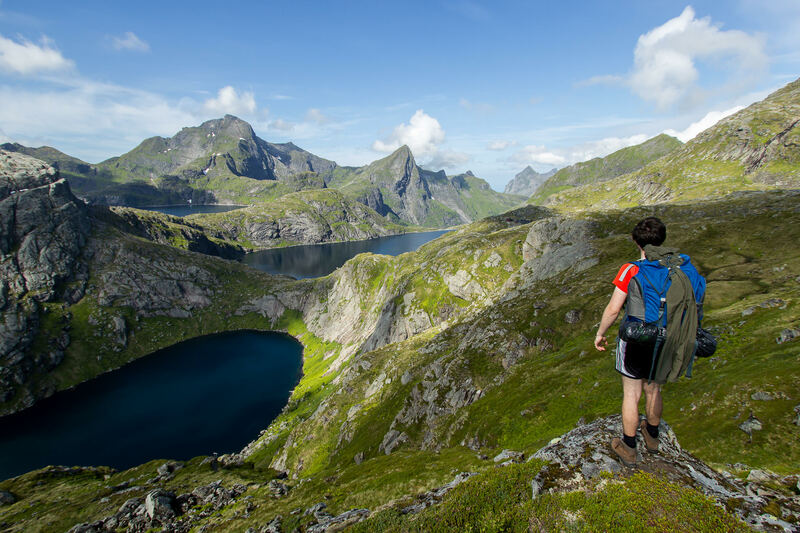 Directions: The Lofoten Islands can be reached by a four hour ferry from Bodo on the Norwegian mainland, or across a bridge at the northern end of the Islands. 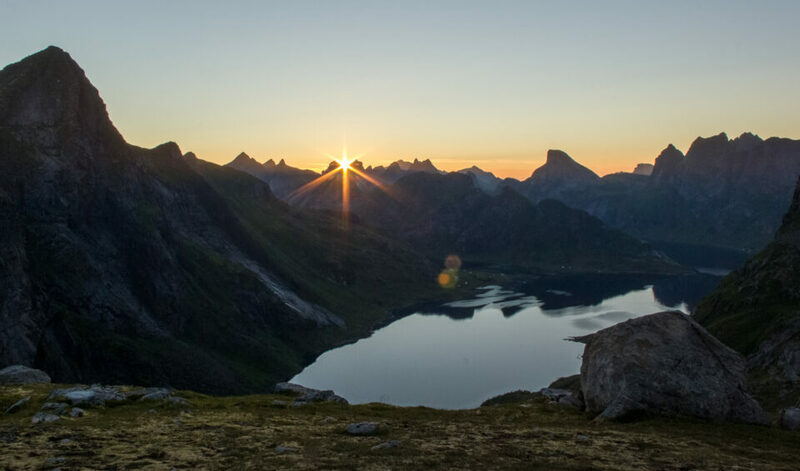 This photo is taken from the summit of Hermannsdalstinden mountain which lies on the very southern Island. The mountain is near a small village called Sorvagen, a short drive from where the ferry arrives. You can hike up a trail from here which is 9km in length, climbing the height of the mountain from sea level. The Lofoten Islands are a true hidden gem in northern Norway. The striking, angular mountains jut out of the Atlantic Ocean, rising to heights of over 1000m. 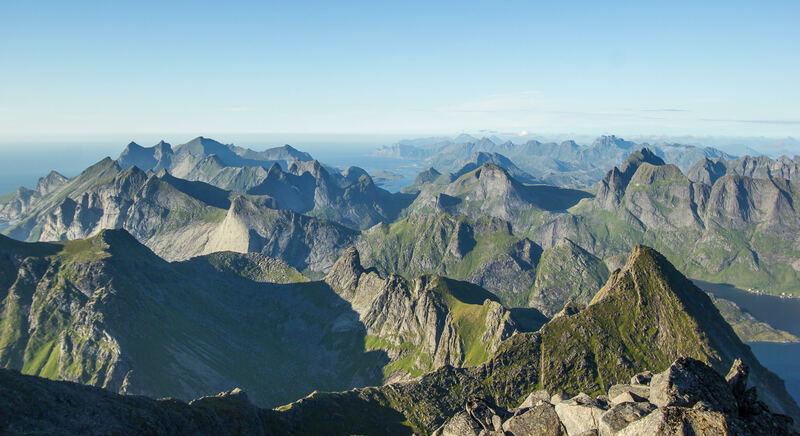 The summit of Hermannsdalstinden (1029m) provides potentially the best vantage point in the entire Islands, with 360 degree views of ocean and mountains. Before summiting, I set up camp at the base of the mountain with stunning views, which would provide an incredible setting for dinner later on. There is an ideally situated lake below the summit which makes an great icy swimming spot after a strenuous scramble back down. The photo was taken in July, meaning 24 hour sunlight, and in the late evening the sun was still far from the horizon. Although, the shadows cast by the jagged nature of the mountains even in bright light makes for a dramatic photo. Summer is an incredible time to visit as ‘sunset’ and ‘sunrise’ last over a continuous period of 2 hours, between 1-3am. The image was shot on a Canon 550D at 10mm, and still didn’t get the whole range in! A panorama would work wonders here, with the best time to shoot being a few hours before ‘sunset’ due to the angle of light it casts over the mountains. Any later and things would become significantly more silhouetted, although this could also be a nice effect.